Looking for that perfect place to get away from it all? Well, Cheerful Valley Campground has just what you’re looking for! 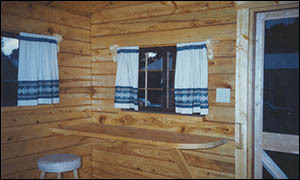 Our super single room sleep cabins offer superb camping comfort in a real log cabin. 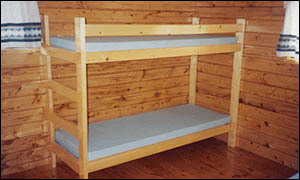 The cabins sleep 5 and include a double bed, bunk bed and loft bed. These vacation rentals are equipped with electricity, lights, ceiling fan, apartment-sized refrigerator, a breakfast bar and screen door. Linens are not included. You will need to bring your own linens, cooking and eating items, and personal items. Outdoors, you will enjoy a 6′ covered porch, fire ring, picnic table and charcoal grill. 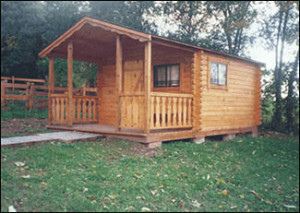 We also offer Rental Trailers for our guests! Save space in the car and come spend a weekend in one of our rentals. You will also be able to participate in all campground activiites that we have going on during your stay! Two Night Minimum Stay Required!